There’s nothing quite like coming home for the holidays. And when you’re lucky enough to be the one hosting all your favorite people in your home, it’s easy to find an entertaining style that works and stick with it year after year. 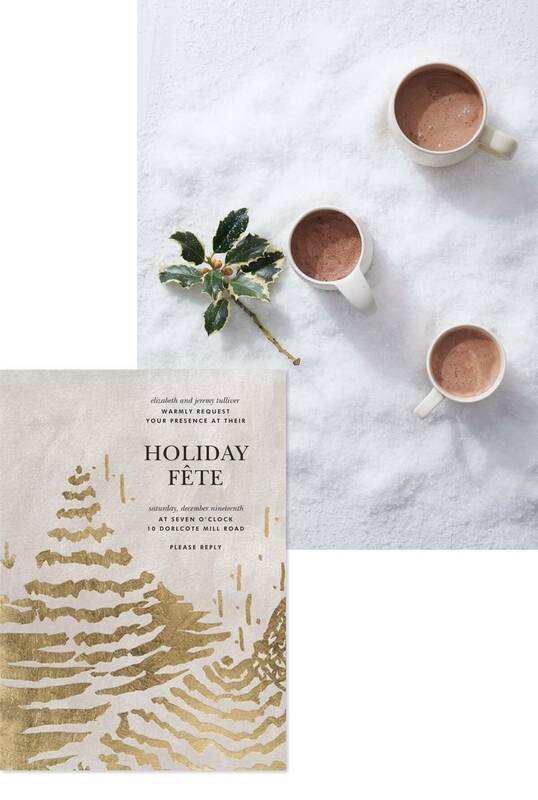 While we love a good cookie decorating-and-eggnog party as much as anyone, here are four unexpected ways to refresh your annual holiday party that everyone knows and loves, starting with a fresh batch of holiday invitations. 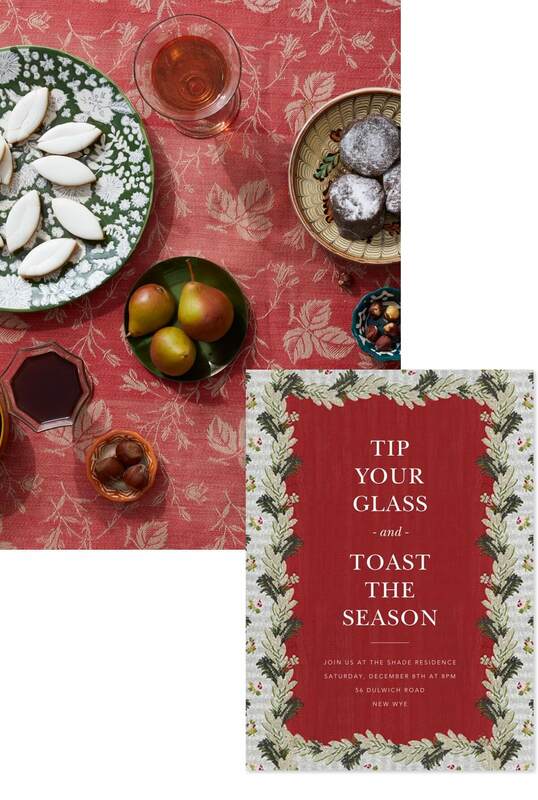 We can’t all be Jamie Beck on her enviable year in Provence, but we can use the rustic elegance of the region to inject your annual holiday cocktail party with some Old World charm. No worries if your guests aren’t exactly Francophiles, we’ll bet they’re fans of rich Mediterranean flavors and a good Syrah all the same. Send: No one knows romance quite like the French. But this side of the Atlantic, the same can be said about our newest design partners, Kris and Laura Vassar Brock of Brock Collection. Their raw-edged, structured gowns are dreamy, feminine, and setting the Fashion Set abuzz, and now their cards are just the thing to add some grown-up romance to your soiree. Decor: Deck your halls with eucalyptus and olive branches, boughs, or garlands to give it that “away from home” feel, no passport required. Drink: Set out a few bottles of earthy reds (preferably French), a batch of mulled wine, and the safest of safe bets, Champagne. Serve: Hearty classics you can make in advance, like a traditional coq au vin, to keep yourself out of the kitchen and intermingling with your guests. 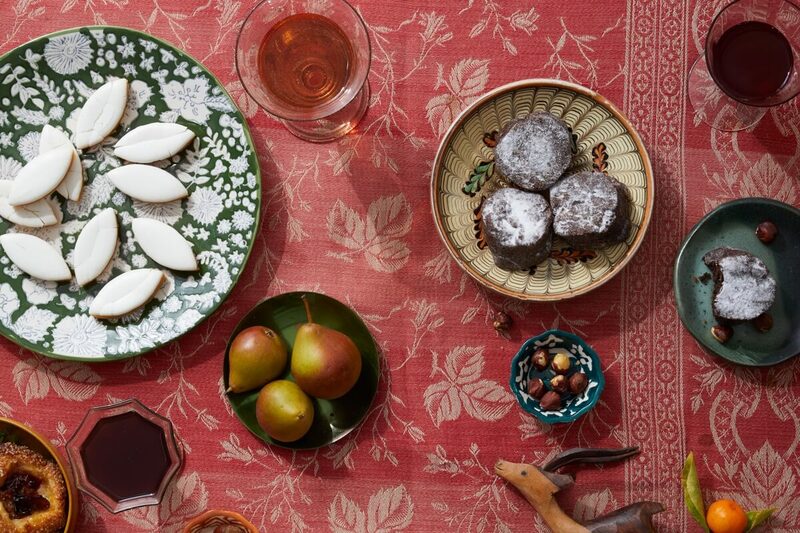 The region is known for its ritual of 13 Christmas desserts. No need to include them all (though we doubt any guests would complain), but add some combination of traditional Calissons d’Aix cookies, fruits and nuts, nougat, and the yule log of desserts, a Bûche de Noël. If you’re fond of the wooly sweater dress code at your annual cocktail gathering but open to a flurry of style, consider adding a little après-ski. Aspen has long been the height (pun definitely intended) of celebratory holiday chicness, and with just a few adjustments your party can cut the lift line to a night of Rocky Mountain glitz. Send: Our gold-flecked Kelly Wearstler collection says winter white meets western with just the slightest hint of retro. Expect guests to dress up their best big sweaters with a cowboy hat or fur. Serve: The best part of a day on the slopes is leaving them to replace all the calories you burned on the moguls with whatever you darn well, please. This boozy pastime is known as après-ski, and it is glorious. A DIY hot toddy station or spiked hot chocolate bar (with a selection of gourmet marshmallows) will keep spirits as high as the (imagined) altitude. Do: Sit around the fireplace or backyard fire pit for s’mores, seasonal songs, and merriment. Keep the theme creative and the cards classic with our Paperless Post holiday collection. Sometimes all it takes to breathe new life into an annual event is an activity. Making a holiday wreath is easy, more personal than the store-bought variety, and more practical than the usual cookie swap. All good arguments for replacing your usual holiday party routine with an afternoon of tipsy wreath making. Send: A casual Flyer for casual fun. The open link makes it easy to share the invitation with all your guests, even if you don’t have their email. Serve: The day is more about the crafts than the spread, so pre-make a good pot of soup to set out, then get back to the project at hand. Drink: The soup of cocktails, a good bowl of punch for the drinkers and an elevated non-alcoholic option for the soda-sippers. Do: Get a wire circle and attach an assortment of greenery from the local farmer’s market, your backyard, or have everyone bring their own supply. Use metal wire to adhere, and be sure to arm you and your guests with garden shears–they don’t have to be expensive, they just have to be sharp! Does wreath-making sound a little too structured for your holiday party plans? Then, by all means, crank up the kitsch and host a Dolly Parton-inspired Sing & Drink-Along. Do: Pick up a karaoke microphone or just play a retro country music playlist, which is easy, since Dolly made one herself, and let the good times roll. Wear: The vibe may be casual, but the dress code should be strict. The bigger the hair, and the longer the nails, the better. Dolly wouldn’t have it any other way. Drink: Whip up a bowl of liquid courage in the form of whiskey punch to chase away any of your guests’ singalong jitters. Serve: Satiate your whiskey-loving friends without cooking a thing. Set up a DIY biscuit sandwich station, order fried chicken, or set out timeless gas station favorites like GooGoo Clusters and Moonpies. Invite your holiday party guests with our completely free and customizable Paperless Post Flyer, then get back to your Dolly playlist.